AFC Fylde have signed forward Arthur Gnahoua from Shrewsbury Town in a loan deal which runs until January 14. The 26-year-old made 22 appearances last season for a Shrews side which finished third in League One and scored three goals, though he has managed only one league appearance so far in 2018-19. 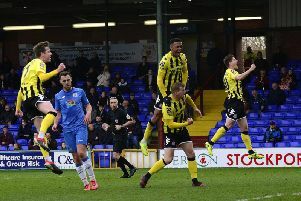 He joined the Shrews in the summer of 2017 following stints with Stalybridge Celtic, Macclesfield Town and Kidderminster Harriers, where he scored 19 goals in 60 appearances and was a team-mate of Fylde's Jordan Tunnicliffe and Zaine Francis-Angol. Gnahoua said: “Playing with them before was great and there was a great team spirit, so I’m looking forward to joining up with them again. “For me, there’s nothing better than scoring, so that’s my aim when I’m here to get amongst the goals. The facilities here are great, and the players were very welcoming at training. Manager Dave Challinor has been looking to add an attacker since Joe Cardle's departure three weeks ago and is pleased to get his man. The Fylde boss said: “We tried to get him in on a couple of occasions actually. He’s a player with lots of ability that will provide us great flexibility. “He’s naturally strong on the left but he’s comfortable on the right too. He’s powerful, creative and will add goals. Gnahoua comes into the squad for Tuesday's visit to Hartlepool United.